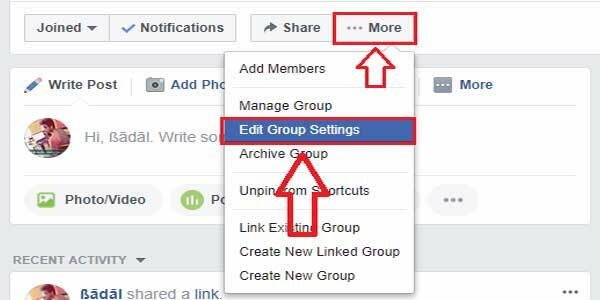 How to Create a Custom URL for Your Facebook Group, FB Group Ki URL Short Kaise Kare? 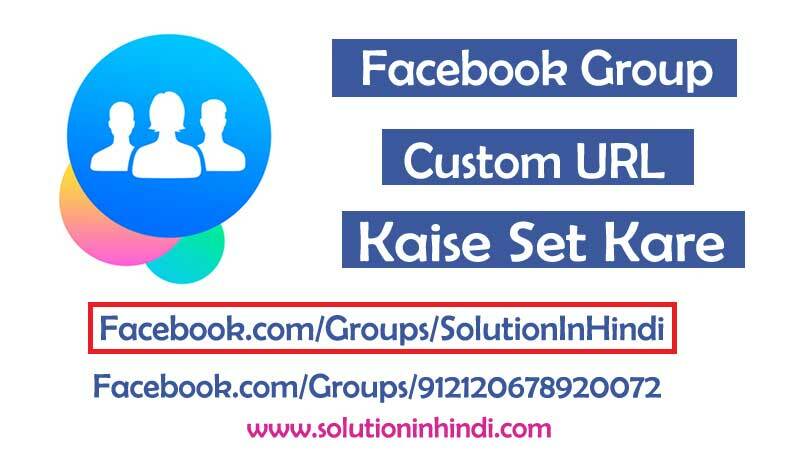 Jee Han Dosto Agar Apko Nahi Pata Facebook Group URL Kaise Change Kare, Toh Aap Sahi Place Par Hai, Kyu Ki Aaj Main Apko Bataunga ‘Facebook Group Ki Custom URL Kaise Set Kare‘ Uski Puri Jankari Apko Is Article Par Mil Jayenge. So Friends Agar Aap Koy FB Group Create Kiye Ho, Aur Aap Chahte Hai Apke Group Search Karne Se Easily Koy Bhi Find Kar Sake, Toh Apko Custom URL Set Karna Jaruri Hai, Isse Group Member Increase Karne Me Asani Hoga, Kyu Ki Aap Kisi Ko Sirf Group Name Bolne Se Agar Woh Banda Apke Group Name Facebook Par Search Kare Toh, Apke Group Top Par Show Honge. Karne Ke Liye, So Yedi Aap FB Group Commercial Purpose Ke Liye Banaye Ho, Toh Apke Group Ke Custom URL Set Karna Bhut hi Important Hai. Aap Jante Hi Honge Ki Group Me Kuch Bhi Post Karne Se Group Ki Har Ek Member Ke Pass Post Hone Ki Notification Jata Hai, Maan Lijiye Apke Group Me 1Lak Members Hai, Toh Kamse Kam Nahi Toh 70% Log Open Karke Dekhe Ga Hi, Issi liye FB Group Commercial Ke Liye Sabse Best Way Hai, So Agar Aap FB Par Jiyada Active Rahte Ho Toh FB Group Ko Bhi Active Rakhe. Facebook Group Custom URL Ka Matlab Kya Hai? So Aap Jis Name Se Group Banaye Ho, Same Name Se Group URL Set Kar Sakte Ho, Aur Custom URL Set Karna Bhut Hi Simple Hai, Toh Chale FB Group URL Kaise Create (Change) Karne Ka Tarika Jante Hai. 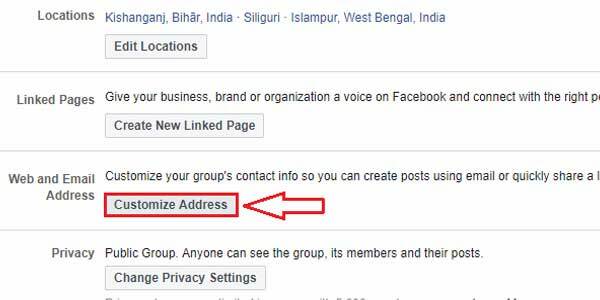 Apke FB Group Ke Custom URL Set Karne Ke Liye Niche Diye Gaye Steps Ko Sahi Se Follow Kare. Step-1 Sabse Pehle Apke Facebook Account Login Kare. Step-2 Ab Apke Group Me Enter Karke, Edit Group Setting Me Click Kare. 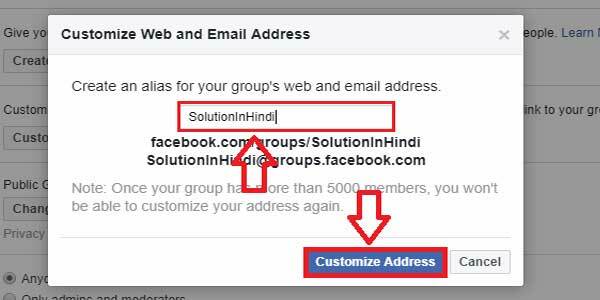 Step-3 Group Settings Me “Web And Email Address” Ka Option Hai, Customize Address Par Click Kare. Note: Apke Grop E-mail Name Apke Group Custom URL Hai. Aur Custom URL Create Karne Ke Bad, Group Members 5000 Hone Par Dubara (Again) Customize Nahi Kar Sakte Hai, So Jo URL Set Karna Hai Soch Samajh Ke Kare. Step-4 Ab Jo Group Ki Custom URL Set Karna Chate Ho Woh Yaha Enter Karke, (Matlab Apke Group Name Dale), Phir Customize Address Par Click Kare. Done! Itna Steps Follow Karne Se Apke FB Group Ki Custom URL Successfully Set Ho Jayega. I Hope Apko ‘Facebook Group Ki Custom URL Kaise Set Kare‘ Uski Jankari Details Se Mil Gaye Honge, Phir Bhi Agar Kisi steps Me Koy Confusion Ho, Toh Comment Karke Puch Sakte Ho.